In April this year we gave you some instructions to make your own bag doorstops but you can also use the same instructions to make lavender bags that can be placed in a drawer, or in a wardrobe ensuring spring freshness all year round, or quite simply place on a radiator to freshen up a room! We recently went to a lovely place near York, called The Yorkshire Lavender Farm where they have been growing lavender for about 16 years. The place is a family business and it has hundreds of different lavender and herb varieties to choose from for your homemade scented lavender bags or lavender sachets. You can easily order some dried lavender and all year long from their website at www.yorkshirelavender.com or if you feel up for a discovery weekend trip in Yorkshire then this place is worth a detour. 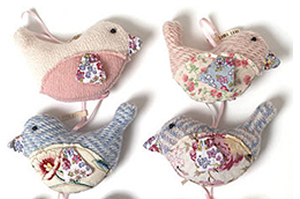 We will give you some instructions below to help you make your own lavender bird bag but dried lavender could also be used to produce some hand-knitted lavender birds, gorgeous lavender hearts or small lavender sachets. For the bird bag, trace off the body and wing outlines and cut them out. Pin the body template to the wrong side of the main fabric and draw around the edge. Cut out roughly, leaving about 1cm all around. Cover the wing with the other fabric. Pin the wing to the right side of the bird making sure it lies in the correct position by holding the fabric up to the light. Slip stitch down. With right sides facing, pin the front to the other fabric and machine stitch around the outline. Leave a 4cm gap along the straight edge at the back. Trim the seam allowance back to 5mm all round, clipping and notching the curves. Press back the allowance on either side of the opening. Turn right side out, ease out the seams and press lightly. Using a teaspoon, fill the bird with lavender, then slip stitch the opening. Fold the tape in half to make a hanging loop and sew the ends to the bird’s back, close to the top of the swing. Stitch on the button to make the eye.